The Course in Strategic Frontiers for Regional Revitalization is a Master’s Program in Policy and Planning Sciences for Working Individuals. The Course was newly established in April 2017 to foster professionals’ ability to identify and solve problems using new methods in this difficult period during which Japanese regional communities face serious issues such as declining birthrate, aging of the population, natural disasters, energy restrictions. The Course in Strategic Frontiers for Regional Revitalization conducts intensive research and education on four elemental technologies; IoT (the Internet of Things), robot sensing, fuel cells, and artificial intelligence, and cultivates individuals capable of contributing to the realization of a “super smart society (Society5.0),” a society in which cyber and physical space are integrated in an advanced manner, as well as opening up strategic frontiers for the sustainable future of regional communities by closely collaborating with the R&D Center for Strategic Frontiers Social Planning. Students will be able to acquire skills to facilitate projects through the compulsory subjects of the course, “Active Learning in Strategic Frontiers for Regional Revitalization I, II, and III”, which requires students to think, make judgments and act based on their own ideas. The photos above show what the Active Learning is like. 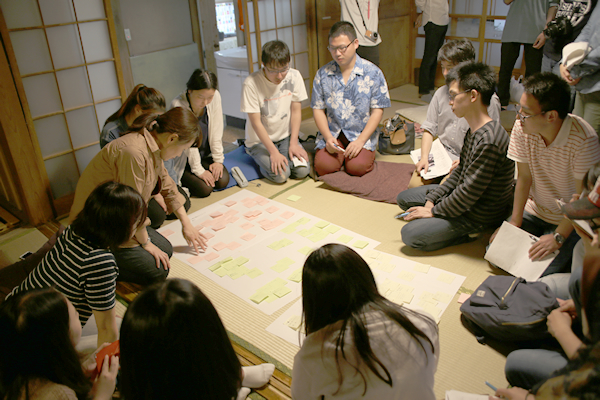 Left: students having a discussion inside a Kominka (Japanese traditional-style house), about the future of agricultural communities. 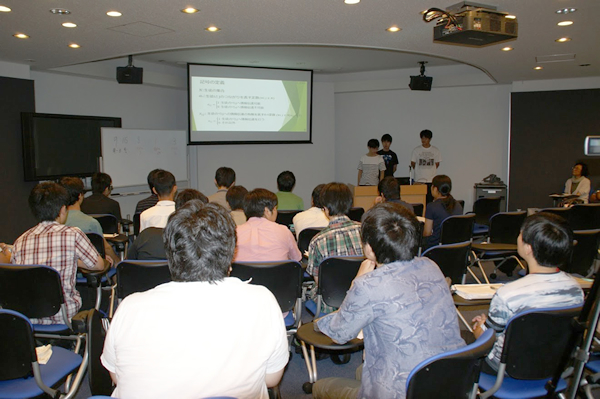 Right: a class works with high-school students to solve problems of rural areas using mathematical models on a seminar lodging trip.